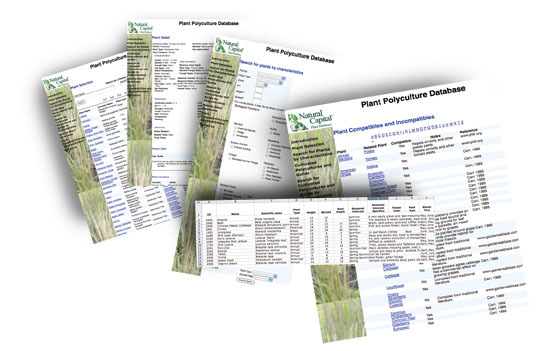 As a "living knowledge tool", the database usefulness is driven by the quality and quantity of input from our plant researchers, designers, and contributing subscribers. Some parts of the data are more complete than others and you may find missing data. We are constantly updating the database, but please let us know when you find an issue and we will take steps to correct it. The integrity of the information is most important to us. By the way, you will not find photographs of plants on this site. Images can easily be found on the internet with a google or other image search engine. Although there have been many contributors to this field we'd like to acknowledge a few in particular for re-invigorating the growing field of plant ecological design. Toby Hemenway in Gaia’s Garden: A Guide to Home-scale Permaculture provides a good introductory framework for the garden ecosystem. Dave Jacke in Edible Forest Gardens develops robust design methods for plant ecological systems. Bill Mollison and David Holmgren for developing the Permaculture Principles and Practices.